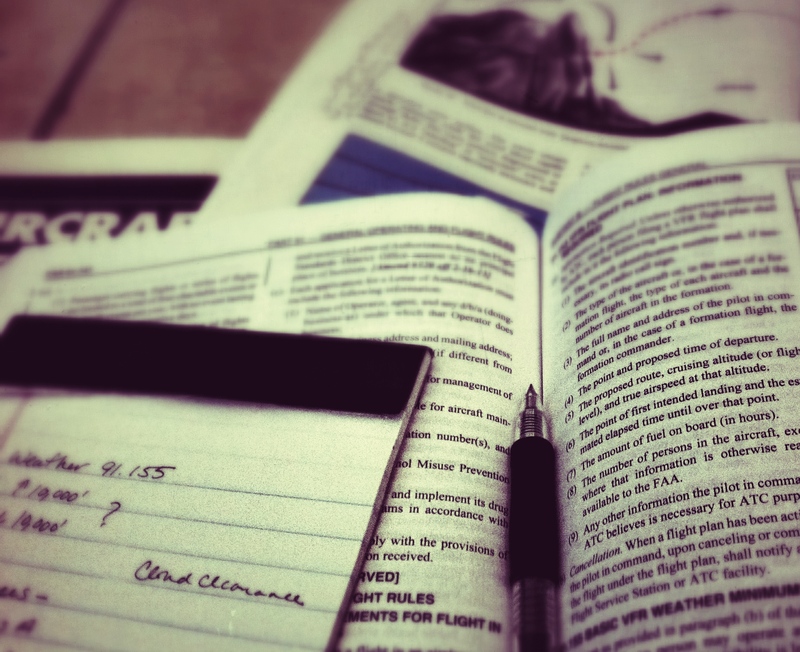 If you’re wondering where to start when it comes to studying for your checkride, look no further. This is NOT a study guide. This is your “compass”, and it focuses on the oral. With studying for an oral, I’ve found that most just don’t know where to begin. With so much material spread out over the past 6 months, year, or two years, the task of prepping yourself to get ready to spit it all out on cue is daunting. You were never given direction on where to start. You were given directions, but didn’t listen (which was me, way back when). If you fall into #2 I’d be surprised, seeing as how you’re here. So for those of you who fit into #1, read on. Start with the PTS, Practical Test Standards (it’s the skinny little book that has the surface area of a half sheet of paper and has an inch-wide dark blue stripe across the top). If you don’t have a copy of the FAA’s Private Pilot Airplane PTS, you can find one here. 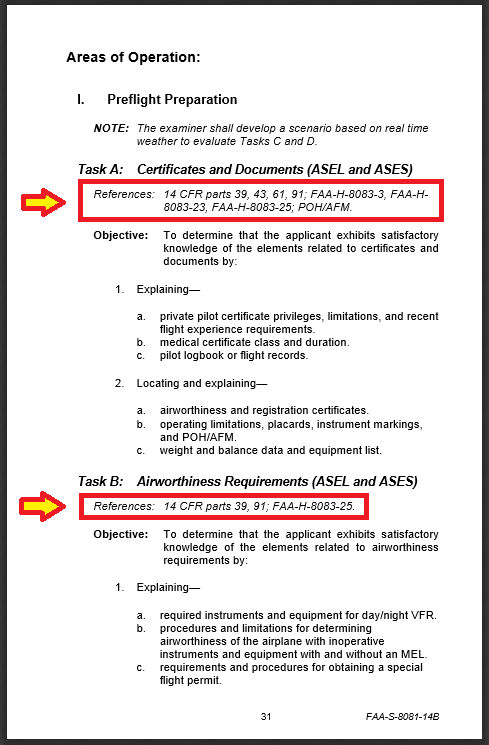 If you’re looking for the rotorcraft PTS or others, just go to the FAA’s Practical Test Standards menu, here. To begin, makes sure you read the introduction at the beginning, focus on the special emphasis areas (these areas will more readily be applied to the flight portion of your checkride, but still important knowledge-wise). The importance of doing this cannot be underestimated. Once you’re done, continue on to the Preflight Preparation section. Start with the tasks that apply to you (each task is lettered with “A”, “B”, “C”, and so on). 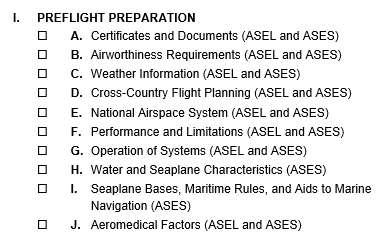 For example, if you are testing for your Airplane Single Engine Land certificate, then you will want to study those tasks in which you see “ASEL” next to them. For example, in the above picture, letter “H” and “I” do not have ASEL in the parenthesis, you do not need to study those sections. I like to call the PTS a pilot’s bible and there’s a good reason for it. The PTS is your road map to pilot heaven, or rather, passing your checkride! There is no way you can fail your oral if you go down the list and check everything off as you study it and KNOW it. 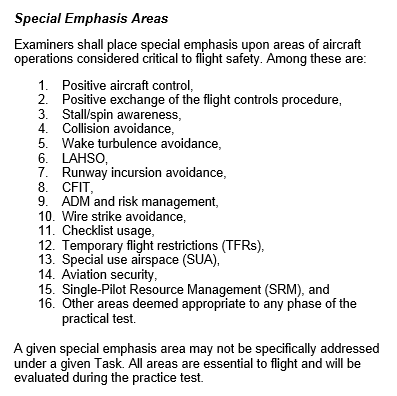 The Preflight Preparation section begins in detail on page 31 and continues on to page 35. Follow the objectives under each task, marking each item off the “list”, and you will be golden. It’s easier said than done, because there really is A LOT to know, but this is your start, middle, and end-point for the oral. Heck, they even give you where to find more on all the material right under each task’s title (see right – I wish I had paid more attention to this as a student pilot). I hope this helps you in your pilot endeavors! Comment below with questions, concerns, or grievances! To passed checkrides and happy flying!